Grace by Elizabeth Scott. Grades 9 and up. Dutton, September 2010. Reviewed from ARC provided by publisher. 208 pages. Grace was supposed to die, but she couldn't. Grace is an Angel, a suicide bomber working for freedom for the People. While Keran Berj terrorizes everything, keeping strict control over the country, the People fight for freedom, for the land. They use whatever means necessary. Grace was supposed to kill the Minister of Culture by detonating her bomb as she stood in the front of a crowd, listening to him speak. She was supposed to go in a blaze of fire and drift up into the arms of the Saints. But as she looked up at the blue sky that day, she realized that she couldn't die. I had an inkling that Elizabeth Scott's newest book was going to be un-put-down-able, and man, did that turn to be true. I read the book in one sitting because I just couldn't put it down (and I was tired, so this is saying something!). It's set in a speculative world, but Ms. Scott brings the reader so far into that world that it could be any world. It could very well be places in our world. The story concentrates on Grace's decision to abandon her People, on her flight to the border, to safety. It's a whirlwind trip and the novel twists back and forth, giving the reader snapshots of Grace's childhood, her Angel training, her mission, and the extreme violence that is commonplace to Grace. This book is just absolutely compelling. It'll definitely spark interesting discussions and give teens a unique perspective. Oh, and I need to take a moment and appreciate that stunning cover. It's so very eye-catching and absolutely true to the book. I love that it uses a photo of a face (so popular these days) in a totally new way. Also, the eyes are really haunting. This is a cover that's going to catch someone's eye from across the bookstore. Well done, Abby Kuperstock! I'd recommend this for fans of Elizabeth Scott's Living Dead Girl and other edgy YA (maybe Ellen Hopkins?). Check out more reviews at The Compulsive Reader, Persnickety Snark, Not Enough Bookshelves, A Blog About Nothing, and The Truth About Books. 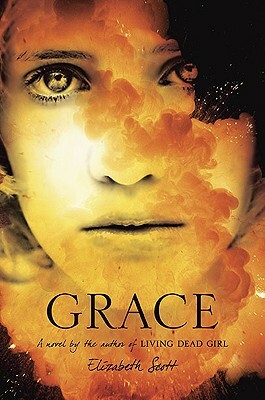 Grace will be on shelves September 16.